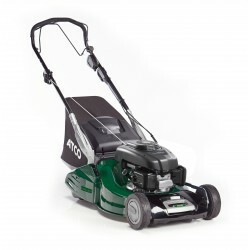 The ATCO 19SE is a self-propelled petrol lawn mower which is powered by a 163CC push button electric start Briggs & Stratton engine and features a cutting width of 48cm/19". It includes a mulch plug, skid plate and a 70L capacity canvas grass collector with bag full indicator. It is suitable for lawns up to 40m2. 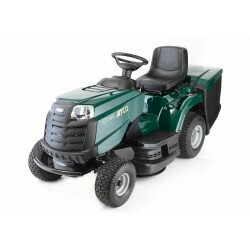 The ATCO 19SE is a Self-Propelled petrol lawn mower which is packed full to the brim with premium features often only found on more expensive models. 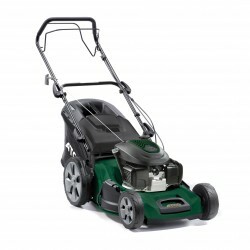 It is powered by a Briggs & Stratton 675IS series push-button engine, which provides power to the 48cm/19" blade and rear wheels. The 19SE really is simple to use. The 19SE has adjustable cutting heights between 25 and 65mm and is adjusted with a single lever. The finest cut is achieved with the help of a front skid plate which has been designed to minimise scalping and improve the cut. The 70L capacity collector has been fitted with a bag full indicator, which saves time checking if your bag is full or not. Cleaning after a busy days use is also a doddle thanks to the hose connector fitted directly to the chassis. 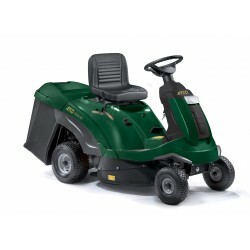 To make moving and folding the handles on this mower, it has an integrated front bumper handle and camlock adjusters. Storage is as simple and quick as possible. 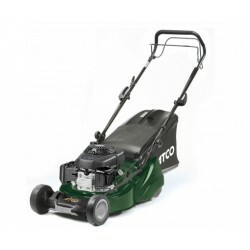 This high-performance ATCO lawn mower also comes complete with a mulching kit. Insert this device into the discharge outlet to finely cut the grass clippings into a nitrogen-rich mulch which his recycled back into the lawn as a natural fertiliser. Self-propelled, no need to push!